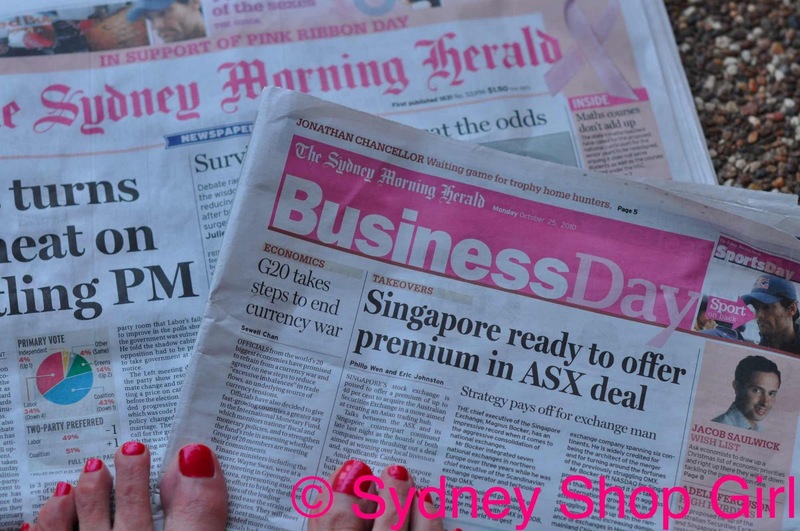 Sydney Shop Girl: Pink Is Not Just A Colour. Pink Is Not Just A Colour. This month, pink is not just a colour. It's a symbol of hope for the future and of treasured memories of sisters, daughters, mothers, grandmothers, aunts, friends and colleagues. It's a wish and a prayer for a cure, of freedom from pain, of dignity. It's a warm hug for those left behind. It's courage for the doctors, nurses and therapists when they deliver a diagnosis, a prognosis and treatment. This month, pink is about breast cancer. Today was Pink Ribbon Day and it is traditionally commemorated by wearing a pink ribbon or an item of pink clothing as a symbol of the wearer's donation to breast cancer research. 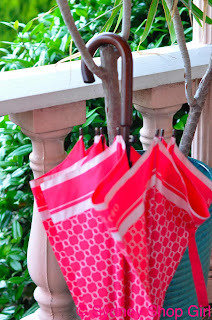 Unfortunately, it was yet another soggy start to the day in Sydney and the only pink fashion item I got much use of today was my pink Oroton umbrella. Note to self. When going for a walk in the rain, umbrellas are great but so too are waterproof shoes. 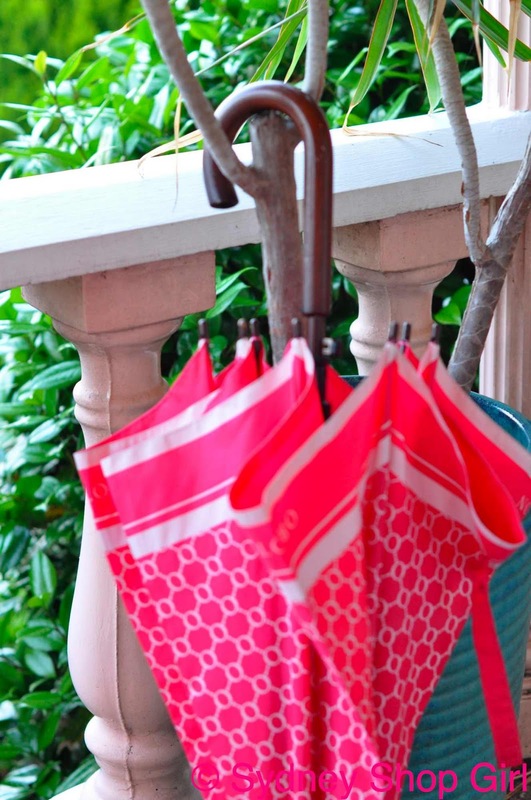 The rain still seems to get under umbrellas. 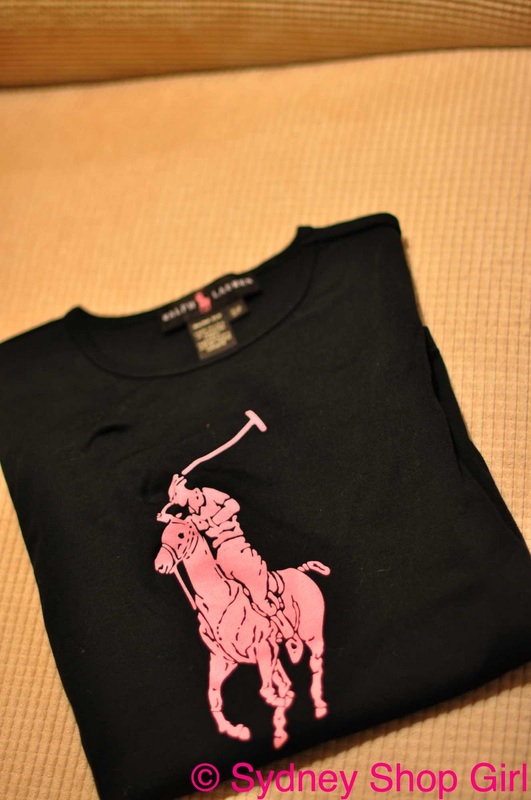 I would have much rather had the chance to wear my Pink Pony T-shirt. But I suspect that even if it had been sunny today, the T wouldn't have made the minimum dress requirement for work. Even if the hand of Mr Ralph Lauren was (sort of) involved. The whole city gets involved with Pink Ribbon Day. We had a pink newspaper today and even the business pages abandoned their traditional banker blue for a splash of hot pink. That's my pedicure in the corner. Met On the Internet by OPI. Which we are - hellooooo!!! It's not often the business pages mirror my life (though we do share a common fascination about adverts for fancy stores) but it seems the ASX loves Singapore as much as I do. The Australian and Singapore stock exchanges are to merge to form some kind of Asia Pacific share trading super power . Or perhaps it was trading hub. I forget the correct financial term. In any case, I will be in Singapore in exactly one month to personally assess the impact this will have on the Singaporean finance sector. I intend to blog my findings live from the St Regis (possibly pool side, I am yet to find appropriate bathers/bather body to go with their deck chairs). There will be live feeds from Ion, Ngee Ann City and selected food outlets along Orchard Road. It will be an intense 2 days but I am more than up to the task. I'm doing it for you, loyal readers of this blog. Before I go, I would like to close with reference to what this post began with. Breast cancer. This year, Pink Ribbon Day has been more than a well orchestrated media awareness campaign to me. It's wonderful that celebrities get behind the day and donate their time to hosting and publicizing the day and the whole month. This year, it got personal. I found out a few weeks ago that a colleague of mine, K, got diagnosed with metastatic breast cancer a few months ago. It came at a time when every else in her life was on the ascent. K had triumphed over the challenges of our profession and did so with a warm and wise smile and endless supplies of humanity. K, I'm struggling to find the courage to pick up the phone and call and talk to you and not about The Cancer. Until I find the right words to say, I've made a donation in your name to the Pink Ribbon Day Fund. It was the right thing to do today. Stay strong and I am thinking of you. I am very sorry to here about your friend. It is a horrible disease as we both know too well. My thoughts and best wishes are with her. Breast cancer is so common that my thoughts always stray into "there but for the grace of God" territory. On a brighter note the Singapore trip sounds divine. Am so glad you have decided to take one for the team so to speak and arrange a visit solely in the name of blogging! All the best for your friend- may she make a speedy recovery. And have a lot of fun in Singapore- can't wait for the live feeds from NAC and ION! I heart Takashimaya, Kinokuniya, LV, Charles & Keith- well, practically any shop there. What a lovely post. I'm sure your friend would be touched by your donation. Try not to over think the situation. I'm sure she wouldn't want you to agonise over raising the issue for discussion. Going through a touchy medical time myself at the moment (totally unrelated and not scary) I know she'd just want you to tell her that you love her and that you are there for her. I don't know your relationship but sometimes it's just that simple. Sending healing thoughts to your friend. my mother had breast cancer and is very much alive as is my cousin who had it last year...we need to find a cure...so I applaud all the awareness and campaigns that are happening all over the world. What a beautiful blog entry. Breast cancer, cancer of all sorts really, touches us all. We are having a Pink Ribbon Day morning tea tomorrow. I will be thinking of those special to me who have suffered from cancer. I am wearing a bandanna on Friday in honour of and hope for a beautiful 16 year old I know who has been diagnosed with cancer on top of another serious illness. It Started To Rain. What I've Been Watching. Halloween On Pitt Street. In the Blackground. Gait Analysis and Pedicures, It's All Feet To Me. A Friday 3/4 of the Way Through October. An Epiphany and Riviera Chic.